Cataracts, no matter which type, fundamentally change (reduce) the clarity of the lens structure of the eye. Signs and symptoms of cataracts are characterized by the patient’s comment that it looks like you are seeing the world through a foggy car windshield or a dirty camera lens. Other signs and symptoms include blurry vision, glare, dull color vision and increased nearsightedness. Cataracts are usually not painful and gradually cause the signs and symptoms. The causes of cataracts are mainly due to the protein in the eye lens being slowly altered over time and cloud the lens. 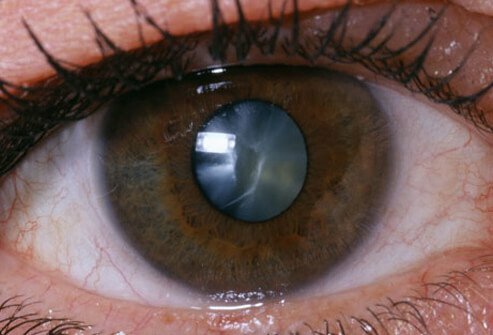 Other causes of cataracts include hereditary enzyme defects, trauma, eye surgery, and intraocular inflammation. Other associated causes may include ultra-violet light exposure, steroids, smoking and diabetes. Having cataracts is often compared to looking through a foggy windshield of a car or through the dirty lens of a camera. Cataracts may cause a variety of complaints and visual changes, including blurred vision, difficulty with glare (often with bright sun or automobile headlights while driving at night), dulled color vision, increased nearsightedness accompanied by frequent changes in eyeglass prescription, and occasionally double vision in one eye. Some people notice a phenomenon called "second sight" in which one's reading vision improves as a result of their increased nearsightedness from swelling of the cataract. A change in glasses may help initially once vision begins to change from cataracts; however, as cataracts continue to progress and opacify, vision becomes cloudy and stronger glasses or contact lenses will no longer improve sight. Cataracts are usually gradual and usually not painful or associated with any eye redness or other symptoms unless they become extremely advanced. Rapid and/or painful changes in vision are suspicious for other eye diseases and should be evaluated by an eye-care professional.